Is it the end of the year already? It can’t be. It was January a moment ago, I’m sure of it. I don’t know if I’ll be able to write another blog post this year, so I will assume this is my 2013 sendoff. As a proper literary nerd that would always prefer to be hidden in the safe, musty comfort of an over-sized chair in a leather-bound paradise of library books, I thought I would reflect in the same way Scrooge or George Bailey was given the opportunity to do. It sounds like the perfect nostalgic way to end a year and start anew. Auld Lang Syne, and whatnot? In the spirit (see what I did there) of A Christmas Carol, I would like to take a journey with Christmas Past to think through the year since last Christmas. This year was filled with changes for me. In January I was living in the frigid Midwest where a foot of snow was the norm. I started rehearsals for my favorite production: Carousel by Rodgers and Hammerstein at Kansas City Repertory Theatre. As the spring progressed, I helped organize a monstrously fun carnival-themed gala. I played piano for an overseas festival in England in the summer and, during that time, interviewed with Kristen for this new position. I moved to sunny Naples, FL, which is a more of a tropical Ferngully than the frozen cornfields I’m used to, and that brings us to the present! I’ve met countless wonderful people and have been overwhelmed by the showing of love, support and encouragement in this community. I’ve joined a team of hard-working, dedicated and talented people making truly GREAT theatre. The holiday season is in full swing, and Christmas is days away – I am filled with joy and warmth for my fellow travelers on the globe and wish peace to our communities, families and friends this season. Christmas Present is alive and well! As we raise our glasses to the future, I am filled with anticipation for the new year. Our theatre is growing and there really is no stopping us! We have a fantastic second half of the season on the horizon: An incredible production of the new play THE GOD GAME, the hilarious THE GAME’S AFOOT, and the all-time classic ALL MY SONS. We are packed with entertainment in the spring and I hope you’re able to join us. 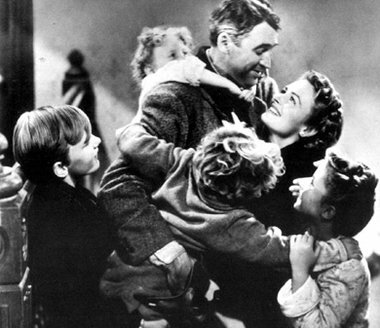 In It’s a Wonderful Life George Bailey asks, “What is it you want, Mary? Do you want the moon? Just say the word and I’ll throw a lasso around it and pull it down.” I ask you the same question, Southwest Florida: What do you want in the new year? You want the moon? How about thought-provoking story and world-class theatre? We can bring you that…and while we’re at it we can sing a rousing chorus of Auld Lang Syne. Just say the word. Happy holidays to you and yours, and God bless us, every one.